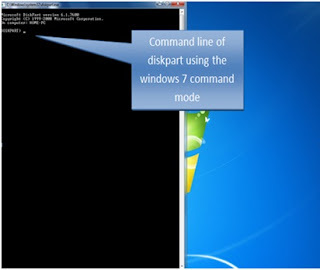 Diskpart is a windows 7 command mode or MS-DOS application. This is the former fix disk in old versions of Microsoft Windows like windows xp. Now you always encounter a problem with your USB flash that cause damage. Because of the viruses encountered in your computer hard drives. When you insert your USB Flash drive, it will pop-up unreadable or format error or any of the problems indicated in your computer once you use your USB flash drive. I will impart to you one of the best remedy on how to recover your drive in this error problem. You are going to select the USB Flash drive, and note be sure to select the USB drive because you are going to clean your drive. All the files will be deleted. Now type in the command line of diskpart, select disk 2. Note this is an example, look at your computer screen and identify the USB drive in your screen. Next is to clean the disk, type clean in the command line. Now select your USB flash drive, right click on it. Under on the formatting window, check box quick format. Click start, wait until it will finish.